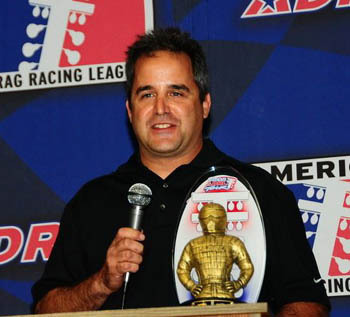 Known for fast starts and strong finishes throughout his standout drag racing career, Marco Abruzzi once again relied on that method in 2012 in the American Drag Racing League's (ADRL) Summit Racing Equipment Top Sportsman class. The end result was one of the biggest moments in a career filled with wins and spectacular seasons. 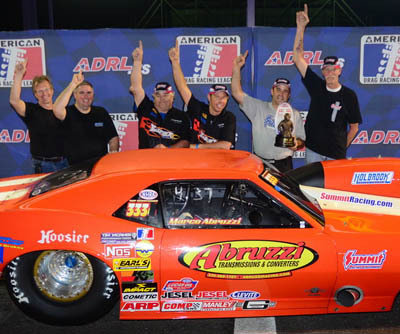 In a championship chase that came down to the final day, it was Abruzzi's strong start and finish that proved to be the difference, as it carried him to the 2012 ADRL world championship in Summit Racing Equipment Top Sportsman. Abruzzi won the first race of the season, became the first repeat winner in the history of the class in September, advanced to a third final later that month and then held off William Brown III and Ronnie Davis in a thrilling finish to capture the first world championship in Summit Racing Equipment Top Sportsman history in the ADRL. "It was exciting. The year started off great with the win in Houston, but it didn't look good over the summer," Abruzzi said. "We did some testing, got a couple things worked out and everything turned out really well. "I really think this is one the best classes around and I was really excited to see the ADRL bring it in. This is some of the best sportsman racing you will ever see and it means a lot to be the first one to win the championship in this class. This has just been a great year." It started in fine fashion when Abruzzi went 4.379 to win the season-opening CarSafe Dragpalooza VIII in Houston. It represented the furthest west that Abruzzi had raced, and, with the victory, Abruzzi committed himself to the championship chase. But adversity came over the summer through a series of frustrating events. He spun out near the starting line in the first round of the memorable 32-car Summit Racing Equipment "Clash of the Titans" event. Abruzzi fell in the first round a month later and then failed to qualify at Dragstock IX in August at zMAX Dragway. That dropped Abruzzi all the way to third in points, and the Warren, Ohio native knew something had to change. Looking back, Abruzzi revealed the simple change that sparked the turnaround. "I just had the wrong tires on the car. I've ran Hoosier Tires ever since I started racing, and I was ordering dragster tires for my door car. The Hoosier guys told me I should have a different tire on, so I put it on and it was like a different car," Abruzzi said. "I lost my step in the middle of the year. I wasn't competitive for a while, and it was getting frustrating, but I stuck with it." Along with different Hoosier Tires and some extensive testing, Abruzzi returned in September with impressive furor. 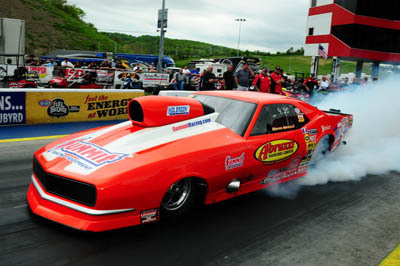 Going into the season Abruzzi had never been quicker than a 4.39, but went 4.24 to win the finals of the Memphis Drags. That put him back in command and Abruzzi advanced to the finals at his home track, running a career-best 4.16 at the Summit Racing Equipment Ohio Drags VI presented by Mickey Thompson. "None of us ever had ever gone as fast as we did this year," Abruzzi said. "There's no other track prep liked an ADRL prepped track." Back in the points lead, Abruzzi finished off the championship by advancing to the semifinals of the World Finals VIII presented by CarSafe, showing tremendous resolve under pressure. It also capped off a tremendous season in a class that surpassed all expectations. "It's a big effort and it was tough, but it's very gratifying. It's a great crew of people we race with in Top Sportsman. They're all incredible people. We just had a blast at the races. ADRL racing is exciting, it's fast-paced and it's great to see it succeed on this stage. It was just a great time this year," said Abruzzi, who thanked Tim McAmis Race Cars and Hoosier Tires. "I also have to thank Summit Racing Equipment for not only sponsoring me, but also the class. They've really put a lot of support into the class and it really turned into a spectacular season."